I wrote this poem last year after a morning of internet reading. Even after seven years of blogging I still get triggered. Social media in all its forms has the power to keep us connected, and it’s a wonderful thing, don’t get me wrong, but sometimes knowing everybody’s business all the time can be draining. It’s hard to keep our eyes on our own page when “everybody else” seems to be rocking the shizzle out of their life/business/relationship (delete as appropriate). Sometimes it’s inspiring to see what’s possible, to join the slipstream of positivity and HELL YEAHS! and be reminded that if she can do it, so can I! *shakes pom poms* But then there are the craptastic days when all it takes is a single Facebook update read in the wrong moment to make you wonder why you even bother. Read it. Print it out. Share it along. Remember it. I hope you find it comforting if you’re ever caught in the eye of the social media crazies (I’ve pasted mine into the front of my journal, just to be sure). I like your poem Susannah. Particularly the last part! Thanks for sharing. Amen, sister! I remember reading this last year, and it resonated as deeply then as it does today. Thank you for naming and voicing what we all feel! The poem is awesome…perfect, right this moment. I’m triggered on a regular basis, even by you at times, but that’s because you’ve managed to do something that I haven’t: I’m literally lost. I wouldn’t unsubscribe from you, though, because you don’t act like everything is okay all of the time, and I can relate to you too much in other ways. I loved your books, and look forward to the next. I think this is why I didn’t read the blog of a successful artist who is my age, until recently, and even now I hardly read. I’ve never gone through her archives: she’s a beautiful person, but she has what I’ve always wanted, and she just did it. She isn’t exempt from sadness either, but her blog had me crying buckets a couple of years ago, so I don’t do that to myself anymore. Thank you Susannah I needed this and thank you for being willing to share you. Ps I had to laugh when I read, ” rocking the shizzle”. Perfect. Loved the poem! Well, just put it in practice. I erased about half of my Old Reader feed (you made the cut ;) ) , same for Twitter , erased also all the Facebook pages I was following but that was drowning my personal feed under the “let’s start this revolutionary thing NOW” or just too many links. I do hope to be able to listen to my own desires. It’s so hard tho. For me it’s manifested by the fact that there is ONE person I can’t delete from my Facebook feed. She inspires me but at the same time puts me in front of my inability to be open , loving , vulnerable in a powerful way. She puts me in front of my fears and shortcomings (especially when it comes to building a community of kindred spirits) by just living her life. It is difficult. The online world is both a blessing and a curse…your poem completely resonates. The same online person can both inspire and bring forth a deep sense of inadequacy as I compare myself to them (and come up short). It’s a challenge. Thank you for sharing your thoughts – they’re a great reminder. Thank you for the reminder Susannah! 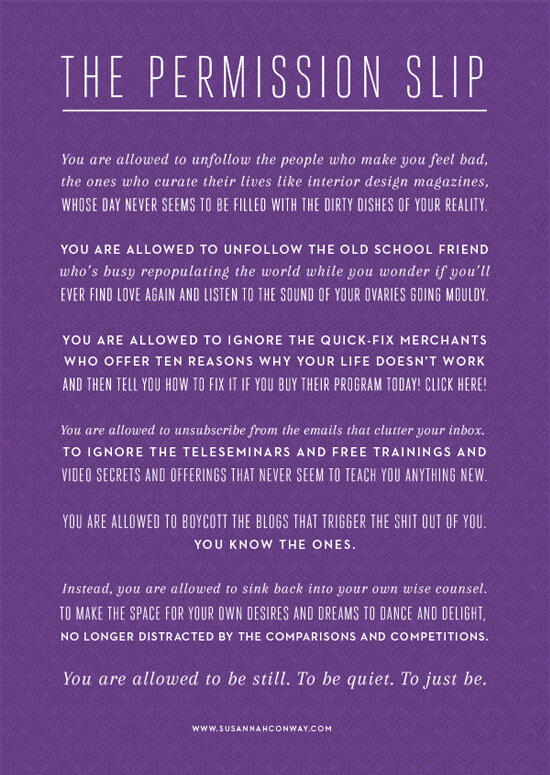 I remember crying buckets the first time you posted this as I was still finding my way and my space in the online world and had just deleted a number of bloggers and aquaintances who triggered the hell out of me, even though they werte hugely poular with others. I notice some new ones have snuck in since then, so it’s time to go on another deleting rampage. Thank you once again for sharing! Facebook is my trigger. I’ve learned to not look at it like I use to. If I’m in a bad mood or its “shark week” (what I call menstruating. Lol) I avoid fb and look at inspiring things like pinterest. I love this permission slip. Thank you! I am 40 years old and teaching myself to code again. Yesterday I got a newsletter with the news that a girl somewhere coded 180 websites in 180 days. I felt my mind spinning out of control. Like, hey, I’m just managing my little HTML and CSS and you -newsletter from hell- give me full on interactive websites of a suposed beginner? I dug a little into what lied behind this claim. I don’t want to take away this girl’s accomplishment but some people believe that it’s just a marketing stunt. The internet loves those stories: huge accomplishment in record time, from nothing to something with sheer resillience, the virality of a video… It’s so crazy. I was talking to my husband just last night about this and this morning reading your poem was like medicine. The only part I wouldn’t agree with is unfollowing the friend who is busy populating the world. I think at a certain point, we have to deal with our issues and not let them consume us. It’s worth digging a little deeper and being happy for your friends and their blessings… And not fair to imprint your problems on them instead of really working out and working on, why you’re sad or triggered. I deal with these issues too, but think its worth my energy trying to work through these problems and switch off from more anonymous blogs etc… The real people, I think, are worth the work. From the other side, I was recently blocked/unfriended on Facebook by a close friend (she was actually my maid of honour less than a year ago) ultimately because she has trouble coping with my life’s happiness and successes, which I don’t feel I ever shove down people’s throats. It’s been really upsetting for me, as someone who has shown her unending support through the years to be discarded just because I happen to have gotten married etc or hit life’s supposed ‘goals’. Everyone has their struggles, and everyone makes their choices. So I really just wanted to touch in and leave a comment as the person who is potentially getting unfollowed because they are doing those triggering things… It’s not nice not being supported by our friends back! I needed to see this today. I have never been the type of person who can be triggered by others’ success. Or the tidiness of one’s kitchen. But lately, and by lately I mean the past couple years, I have been feeling so damn insignificant. I only make matters worse by trolling pinterest and blogs knowing FULL WELL I will feel worse afterwords. It’s like binge-eating, well I binge-blog. Ugh! Time to take a little bit of control over this jealousy monster inside of me. Thanks for sharing this. A lot of it resonated with me as permission I need to give myself. Brilliant poem. Thank you so much for sharing. I think it’s important to remove toxic areas of one’s life and this includes creating some distance sometimes. Even from reading blogs. Hi Susannah, I agree, sometimes I love the internet and sometimes I am so overwhelmed by it that I need to take a break. Sometimes it is just nice to hear someone else say what you are thinking to yourself. Susannah, I have been mulling over this post for the past week or so and I have to be brutally honest, it’s riled me. I know that this issue has been discussed on your blog before, and I’ve agreed that the shiny, happy blogs can be irritating at times. But, in the spirit of honesty, I found the permission slip to be a bit mean spirited. Yes I know that you have addressed that ultimately it’s about your issues and your honest can only be acknowledged and appreciated. But it’s still mean spirited. What I wouldn’t be sharing is the details of the end of a very important relationship. What I wouldn’t be sharing is a year of hell with a special needs sister who gave birth to a still born baby boy. What I wouldn’t be sharing is the details concerning the complete breakdown in communication with the Father of my son. What I wouldn’t be sharing is the details about the two blood clots that I developed last November. And there would be a reason for not sharing that information (ironic that I should do so now in order to make my point). But that reason is privacy. Everyone has the right to privacy, even within the sphere of social media. And if retaining that privacy means portraying an unrealistic image of their lives, then so be it. Susannah, I have been following your blog for years, twitter and instagram for years. And I really enjoyed reading your book. But I think that this post has done it for me.